Peak speeds have jumped from the 200Mbps range to the 300Mbps range, average download speeds have bumped up by 10Mbps or more, and latency has dropped by 10ms. That’s an impressive change in one year, and it continues the trend of improvement that we’ve seen over the past several years of testing. As we get to a world where we can assume 20Mbps or higher download speeds on 4G in most cities, other questions arise: Where are those speeds most consistent? Where is the network most responsive, especially when you’re downloading pages made of many small files? Our tests cover data speeds and reliability; we don’t make voice calls. But our awards for data service apply more and more to voice, too. All of the carriers other than Sprint now use voice-over-LTE, piping their voice calls through their data networks. So the reliability of those LTE data networks translates into the reliability of your HD voice calls, as well. In Southeast Asia (including Japan, but not China except for Hong Kong), Seoul and Singapore are the fastest 4G cities, according to a regional ranking of major cities from OpenSignal. 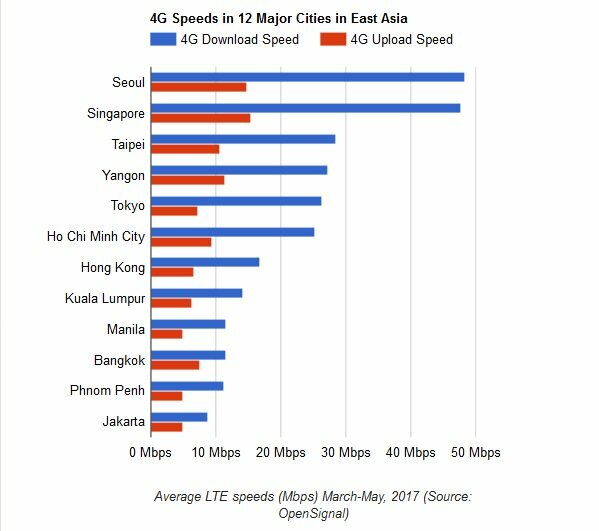 An analysis of 12 cities in the region shows that Seoul recorded an average 4G speed of nearly 50Mbps, with Singapore close behind. Four cities demonstrated 4G speeds of over 25Mbps – Taipei, Tokyo, Yangon and Ho Chi Minh. The latter cities have benefited from having launched 4G just two years ago, which OpenSignal said suggests that they have not yet filled their networks to the extent that speeds have started to decline. The final six cities examined all had speeds at or below the global average of 16.9Mbps. Hong Kong was highest among this grouping, followed by Kuala Lumpur, Manila, Bangkok, Phnom Penh and Jakarta. OpenSignal noted that Southeast Asian operators are focusing on improving coverage over speed. Singapore topped the list for average 4G upload speed at 15.4Mbps, followed by Seoul and Yangon. But the gap between the fastest and slowest upload speed was only around 10Mbps, with even the slowest cities in the region, Phnom Penh and Jakarta, averaging 4G upload speeds of 4.9 Mbps. As 4G connections are far superior to 3G connections, Southeast Asia’s wireless network operators seem intent on making LTE services accessible to the vast majority of their customers before they turn their attention to raw speed. Verizon has caught up to T-Mobile in our 4G availability metrics. The two weren’t just statistically tied, their scores were numerically tied. Our T-Mobile and Verizon users on average were able to find an LTE signal 93.7% of the time. Sprint has been making plenty of progress in our 4G metrics over the last year, and in this test period it managed to pull nearly even with AT&T in our 4G availability category. Sprint also came within 600 kbps of matching AT&T’s 4G download speed of 15.1 Mbps in our measurements. OpenSignal Report: 4G speeds are on the rise once again in the U.S. Operators are beginning to cross the 20 Mbps barrier for 4G download speeds, but perhaps more telling are the results we’re seeing on the regional level. In big cities like New York and Detroit we’re measuring 4G connections in excess of 30 Mbps, an indication of network capabilities to come. Analyzing more than 8 billion measurements, OpenSignal once again revisits the U.S., comparing the 3G and 4G metrics of the country’s big four service providers. OpenSignal recently published its State of Mobile Networks report for the US, and in it we tracked some significant increases in 4G speed across the country’s mobile networks. The most interesting speed results we saw weren’t on the national level; rather, they were in big cities. In New York City, Chicago, Detroit, Minneapolis, Cleveland and Kansas City we measured average LTE download speeds of 30 Mbit/s or greater on Verizon or T-Mobile (in some cases both). These were the fastest speeds we’ve ever seen on US networks by far, and we think they’re a good sign that the US may be reclaiming some of its lost glory when it comes to mobile broadband innovation. The US has always been a global leader when it comes to providing a consistent 4G signal, but ever since the early days of 4G launches it has fallen well behind Europe and East Asia in LTE speeds. There are a lot of reasons why the US has lagged its 4G peers in speed, but the biggest reason is spectrum. When the big global 4G powerhouses launched their initial 4G networks, they often had big, unencumbered chunks of spectrum to play with. A 20 MHz by20 MHz block fresh off the auction block forms a solid foundation for a powerful LTE network. Meanwhile, the US dove head first into the 4G age with the spectrum it already had its disposal. Verizon and AT&T debuted their 4G services the 700 MHz band they’d won in 2008. Sprint took the 2.5 GHz route for LTE after several attempts to make other mobile broadband technologies work in the band. (Remember WiMAX? How about ION?) Soon operators expanded into the Advanced Wireless Services bands and began cannibalizing their 2G and 3G networks for PCS and Cellular spectrum. Through refarming and acquisitions, US operators were able to cobble together more LTE capacity, 5 MHz here, 10 MHz there. It’s a strategy that has served the industry well, but ultimately it meant speed gains have come incrementally. Meanwhile the big operators in Europe and East Asia began pushing the limits of LTE-Advanced technology to squeeze even faster connections out of their networks. In OpenSignal’s February State of LTE report, Singapore, the Netherlands, Norway and South Korea had all passed the 40 Mbit/s for average 4G download speeds, while another 14 counties had surpassed the 30 Mbit/s threshold. The US , however, was still languishing in the bottom third of our table with an average LTE download speed of 16.3 Mbit/s. But we may very well be at an inflection point. The 30 Mbit/s speeds we see in NYC and Chicago are the fruits of intensive spectrum management and new LTE-Advanced upgrades. And typically we see these kinds of enhancements starting in the big cities and then spreading throughout the country. It may be some time before a 30 Mbit/s becomes commonplace throughout the nation, but this could easily be the start of a steady climb back up the global rankings. Why does it matter whether the US is faster or slower than South Korea or the Netherlands? It matters because the mobile industry is an industry of technological innovation. The newest apps and services are designed to take advantage of the best devices and the best networks. As mobile apps embrace the world of 4K video streaming and virtual reality, speed will play a decisive role. If the US isn’t among the power players in speed, it risks being left behind as mobile apps steadily march forward. We’re on the precipice of 5G, so a renewed focus on 4G speed in the US may seem like it’s coming a little too late. But 4G won’t simply disappear when operators flip the switch on their 5G networks. LTE networks will form the backbone of our mobile data services for years to come. What’s more, the new 4G networks being built today will form the foundation of the first wave of 5G mobile services we see in the next few years. These early 5G implementations will improve upon LTE-Advanced networks already in the market, so the faster operators make them and the more capacity they build into them, the better those initial 5G services will be.